This spread came together fairly quickly...and that's a good thing. We hope your art journaling techniques have become second nature to you. It feels so good once you've developed your own "thing"...and work comfortably in your zone. It makes escaping into your creativity that much better! As with previous classes, we made a video slide show. Of course on it's own it only gives an idea of each step, so we included full detailed instructions for you to follow along. In the upper left corner of each photo in the slide show you'll see a title. In the instructions we've titled each step with those same titles so that you'll have an image to match each step. You can view the video once, or twice, or more...pause where you'd like, rewind, fast forward...watch it here on the blog, full screen, or on youtube. 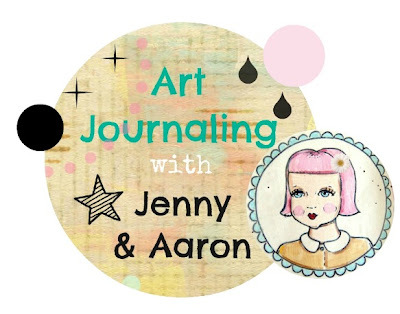 This week we wanted to focus on the "piling up" method of art journaling. 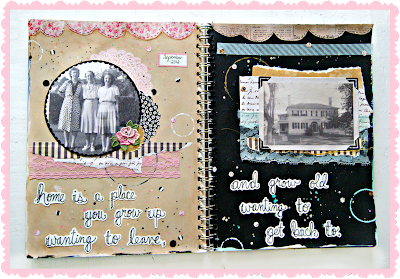 A very popular approach in scrap booking. It's fun to take your elements and stack them up...with edges and corners peeking out...using fabrics, papers, lace, doily, even some thread. Layering textures is the name of the game. Another thing we wanted to do was work on top of a black base. We've done white...and now it's time for black. It's a great look...your colors really pop on top of black. And to do an opposing page in a lighter contrasting tone really brings attention to the black. A fun part of this approach is when you gather your elements in the beginning...you then have a choice to make...what elements will land on top of the black?...and what pieces will land on the lighter background? You then separate the elements into two camps. So, give piling up a shot...and give BLACK a shot. back your photos with watercolor paper. 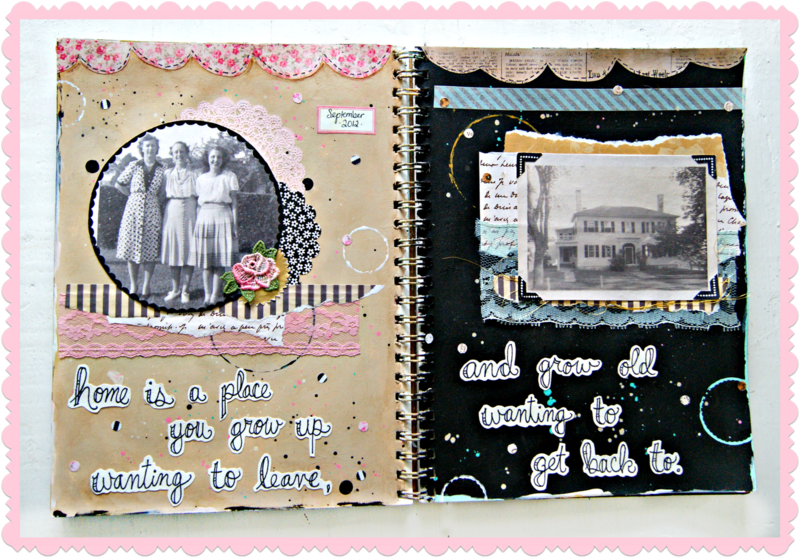 This spread pretty much will focus on the two vintage photos. Since these are going to be piled up on top of other elements we first backed the photos with watercolor paper so they were sturdy and so that they wouldn't crease. Just use your favorite decoupage medium to adhere them to watercolor paper, cut out, and set aside. paint your pages. We wanted to work with bold solid colors for our backgrounds. We used acrylic paints by Blick. we chose tan & black. We like the idea of having opposing color schemes on pages that face each other. And since we were going for a very aged, vintagey feel, we went with tan and black. We thought these colors were perfect contrasts to our vintage photographs. speckle. Speckling light colors on top of dark and dark on top of light is a good rule to follow. speckle some more. And also, try to carry through your color scheme by selecting matching paint colors for your speckling. You'll see that the pinks match our pink florals and lace, and the aquas tie in the lace and the washi tape. add paint rings. One of our signatures...bottle cap rings. simply brush paint on the rims of assorted bottle caps and stamp down on your pages. color wash. In this case we wanted an aged color wash. Just mix brown or tan tones of paint with a bit of water and brush wherever you'd like the wash to appear. Then dab with a dry paper towel. "distress" edges with paint. Simply rub paint on the edges of your pages. We call it distressing because it's similar to distressed edges of painted furniture. Only on furniture, the paint is rubbed off...but here, we're rubbing paint on. Use a paint brush or even your finger. distress some more. Just as with the speckling...use light colors on top of dark, and dark on top of light. play around with layout. This is the time to pull all of your elements together...pick which page they're going on, etc...We're kinda going for an 'opposites attract' theme. It's all about contrast...light colors on dark, and dark colors on light. adhere papers & trim. Once you've got your layering all figured out then adhere your elements a piece at a time. when dry, seal. 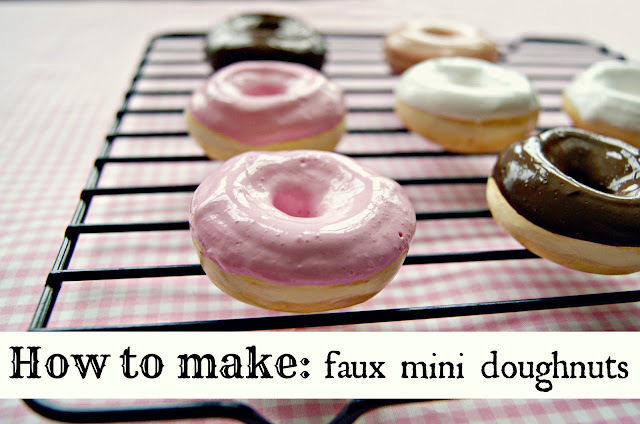 Once they are dry, then apply a coat of your medium to seal them. stamp some photo corners. To give an old washed out photo some importance and some pop...stamped photo corners like these are great. We stamped them with Staz On ink in jet black onto watercolor paper. cut out and adhere corners. Once dry, cut the corners out and adhere them to your photo with a little bit of your decoupage medium. paint a tiny border. The other photo needed some pop as well so with some black paint we painted a quick scallop border. This is easier than the end result would indicate. Really, just freehand it...don't worry about it being perfect...it's like doodling but with a paintbrush. add gold thread. For this piled up effect we thought some haphazard twists of gold thread would look great peeking out from under the photo. We simply brushed some decoupage medium down, pressed the thread down and let dry. adhere photos. Now it's time for the focal points, the photos. It's a little harder to adhere elements that are backed with watercolor paper since they are sorta thick...but they will stay down. Just apply medium, then lay photo down and press firmly until the corners stay down for good. We usually press down with a clean dry paper towel so that we don't smudge the face of the photo. add decorative elements. It's the little details that count. We thought this applique rose was perfect for this photo of these gals in their dresses. shade with watercolor pencil. Watercolor pencils are great for adding shadow...underneath this scallop totally called for a shadow. Just shade in with the watercolor pencil and then blend with a damp paint brush. add faux stitching. Sharpie pens are an art journal's best friend...and faux stitches are a paper scallop's best friend. add some words. We were going for a home/family theme and had just the phrase to bring it all home. adhere words.We wrote it on watercolor paper with a sharpie pen, cut it out, and adhered it word by word with decoupage medium. to both pages. We like to carry a theme from one page to the next and what better way than with a two part phrase? grab a hole punch. We needed more texture and color...and we're gaga for polka dots. So grab a hole punch, some patterned papers, and punch a bunch of confetti. add some confetti. Adhere to your pages by just tapping dabs of medium to the page with a small paintbrush, and then lay a piece of confetti on top of the dab. and some washi tape. I don't know if I can resist the washi tape urge. The page needed something...and all it took was one strip...and bam...color, pattern, and fun. add a date tag. Again, a date tag is essential. Capture this moment of creativity...give it the importance it deserves. Looking good! At this point we always assess the situation...is it done? Loving the black! Isn't the black just so striking? Everything pops on top of black. feels good! Believe it or not...this is kinda minimal for us. But that was the point. We wanted to essentially focus on two piles of elements. Hooray! All done with Week 7! wow...we hope you guys are having as much fun as we are. mini black and white floral, 1429-black bouquet, doodlebug design inc. Thanks so much again for joining us! 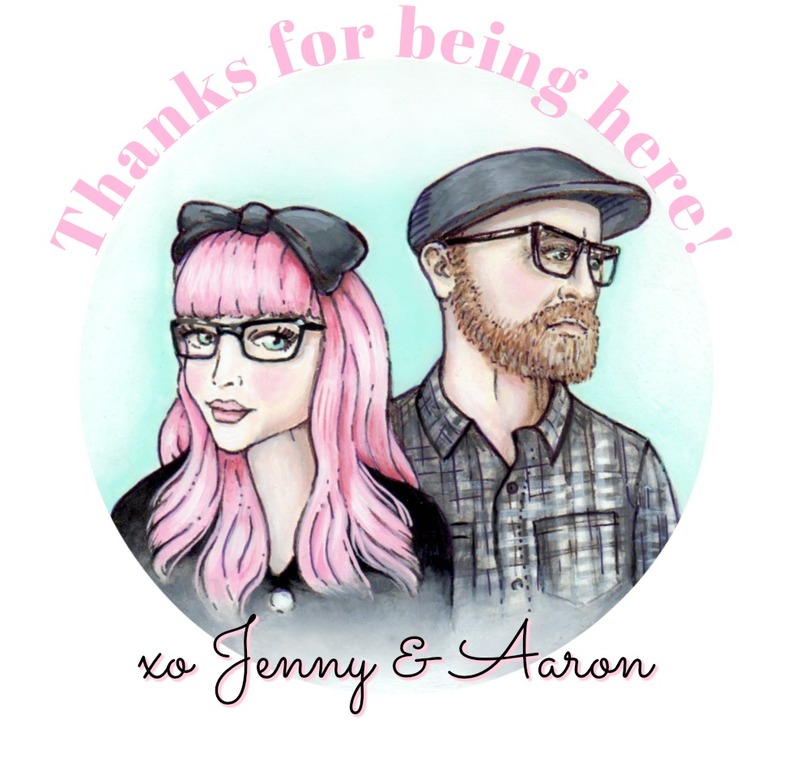 Please feel free to grab our Art Journaling with Jenny & Aaron badge and share it on your blog, facebook page, etc... And in the comments please link up with us to share YOUR Art Journaling. It's unfortunate that we will no longer be using the link up widget that we have been using each week... as per usual on the internet...someone linked up some adult material to last week's page. And I couldn't just remove the one triple X link...I had to remove all of the links. So to avoid that issue from now on...please link up with us in the comments section. I know, I know...there are always gross party poopers out there. Oh well, no prob...we can still all link up. And please do...we LOVE seeing your stuff and reading about your methods, etc...Thanks so much again for joining us! Keep up the awesome work! Boo on the link spammer!! Weird, is there no way to moderate that? That's annoying!! Anyway, you guessed it... I LOVE this page spread! Hehe. I'm pretty sure you're not capable of making something sub-par even if you tried. =) Very cool with the contrasting pages. Loving this week's tips! You know, I don't think I own any watercolor pencils, but sounds like they'd be a neat addition to my art supplies. Gorgeous!!! Loving the black background and those layers!!!!! Inspired by you, I've just startet journaling to day, all about gardening. I could hardly stop for preparing dinner. Oh, It's funny. Thank you. I'm dying for some Washi tape. Some of my pages fell out of my book :( So I've started using drafting tape that I had from my school days. So I was curious when i get some cash, where would I get my best bang for my buck in the world of Washi? Do you have any favorite sources? Thanks for challenging us last week, I'm much happier with my page this week... and I know it certainly could have gone in the other direction had I not stayed focused. Thanks so so much!! Yeah I love the black! It ends up looking so classic! And colors pop! @Pamela Thank you so much! :) Happy to share! 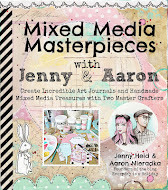 Again, we are so excited that art journaling has been such good medicine for you! You are an inspiration! This looks like so much fun! I just took some art classes last semester and I would love to join in!